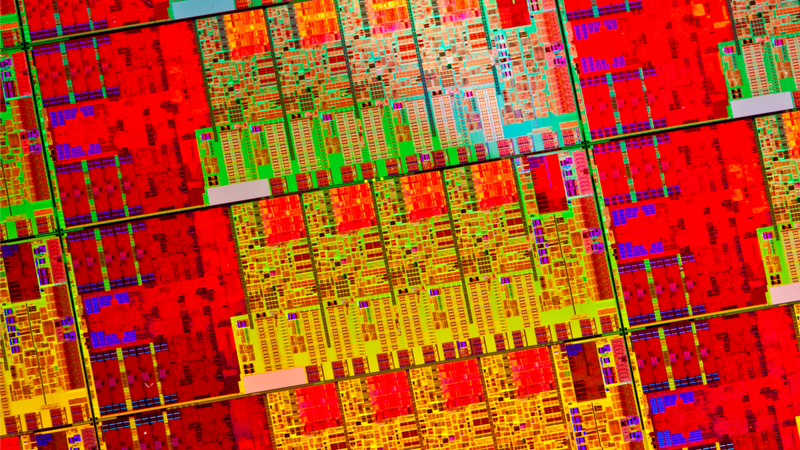 Bits and pieces of info about Intel's brand new 4th generation processors have been dripping out for months now. Good graphics, crazy battery life. Exciting stuff. Finally, though, we've got a full view of guts that'll power most of next year's computers, and they'll be available starting June 4th. The future looks very, very bright. To put these chips—previously known as Haswell—in their proper perspective, remember that Intel has what it calls a tick-tock system when it comes to processor upgrades. The tick is a smaller, incremental upgrade where things get shrunk down and tuned up. The tock is where the big changes get made. This is the tock. At a glance, the 4th gen chips don't appear wildly different from their predecessors. While the chips have grown just slightly in size, from 160nm^2 to 177nm^2, they're built on the same 22nm process. So why slightly bigger? To accommodate the biggest graphics on-die space Intel's ever had. And that's just for starters. Here's the full rundown of what these bad boys can do. What's maybe most exciting about Intel's 4th generation cores is the leap ahead in battery life. It's the biggest in Intel's history. The gains come from a few different places. For starters, the 4th gen chips pull less power than their predecessors for CPU tasks, but they've also got some sophisticated sleep states and panel refreshing are able to cut back on power used by the rest of the system as well. When it comes to practical applications, that means that you'll be getting 9 hours of HD video playback where you used to get only 6, and similar increases when you're just using your device for light-use things like browsing the web, or working in a word processor. The really huge jump is for standby time though. With previous-gen Ivy Bridge cores, you'd be lucky to get four or five days of standby life on a full charge. With a 4th gen core, Intel's promising a number more like 10 or even 13. And this is all with no better batteries required; the gains are purely from more efficient performance. To explain it simply, devices running on 4th gen chips will be able to sleep way more often than what you've got right now. Essentially, Haswell's introducing a new kind of sleep state that marries all the power saving qualities of an actual, non-responsive sleep state with being totally awake. So now, when you close the lid (or turn off the display), your device can take a power nap, but still be damn quick waking back up. And those little naps count for a lot. Intel had already let slip some of the details about its sweet new integrated graphics brand a few weeks ago. In sort, Intel's Iris graphics are able to hold their own in a way they never have before, running stuff like Bioshock Infinite at playable speeds with moderate settings. Granted, there's still nothing quite like have discrete graphics in your laptop, but these 4th gen cores do built-in damn well. Super small laptops and convertibles running U-series processors chips in the 15w range are going to be treated to a nice performance increase in graphics power thanks to Intel HD Graphics 5000, the next step up in Intel's traditional integrated graphics line. But laptops with more power-hungry chips in the 28w range are treated to Iris, and real chunky, performance-first devices in the 50-ishw neighborhood and up are going to see even bigger gains with top of the line Iris Pro, using on-die eDRAM high-speed memory. But all of them will be able to handle things like OpenCL, DX11.1, OpenGL4.1, making things like playing Tomb Raider on your laptop possible. And the graphics advancements aren't just limited to gaming. The new chips also support three-screen displays and UHD (4K) output by default. And even if you're not pushing that kind of video right now, it's going to be good to have the option when super hi-res displays start getting more affordable. Getting your video onto other, bigger screens that aren't attached to your device is going to get easier too. 4th gen chips will have Intel's Wireless Display (WiDi) 4.1 built in. It's not as open as something like Miracast, but it does support wireless streaming of HD video, and it's already in some LG and Toshiba HDTVs. And with it baked into 4th gen Intel devices from here on out, you can bet that trend will continue. In reality, there's really no such thing as an "ultrabook," but that doesn't stop Intel from laying down a definition of what it thinks a thin, ultraportable laptop should be, and what a thin, ultraportable laptop on current hardware can handle. And when Intel sits down to describe its dream scenario for an "ultrabook," it's setting the standard pretty high. We're talking touchscreens and voice control capability across the board, the ability to handle at least 9 hours of idle time on Windows 8, at least 6 straight hours of HD video, and seven days of standby time. And damn snappy too; we're talking wake times under three seconds. Granted, nobody's going to be forcing OEMs to live up to these kind of standards, and they're going to build whatever the hell they want as usual. But it definitely says something about what Intel things is possible—and important—for even the slimmest of the slim this time around. And if these ideal ultrabook specs are any indication of the reality we'll actually see, slim laptops won't have to skimp on key features. Windows 8 put the dream of a real computer that's also a real tablet on the to-do list for manufacturers everywhere. The onslaught of tablet-laptop hybrids alongside Microsoft's own first-party Surface push shows it. But no one's really hit that sweet spot yet. For the most part, at best you get a tablet with a keyboard. Or occasionally something weirder. Intel's aiming to bridge that gap this generation with a new line of ultra-low power, but still fully-featured mobile processors: the Y-series. In the past, 17W U-series processors have been the brains of ultrabooks everywhere. Detachables and almost-a-tablet slate PCs have been stuck with low power chips that aren't even in the same ballpark, like Atom or ARM. Now, the U-series is reaching new power lows by hitting 15 watts, but the Y series is taking things even further, dropping down to a ridiculously low 6w, specifically for use in ultra portables where all those guts have to fit behind the glass. With Y-series chips under the hood, detachables should actually be able to hang with the rest of the crew. They'll still be at the bottom of the list when it comes to capability, but they won't have to sit at the kids' table any more, stuck with a processor that's not quite the real thing. And if, by chance, you still have a desktop and you've got no interest in going mobile, it's not a bad time to check out an all-in-one either. Battery life's not really an issue there, but Intel's 4th gen cores have a lot to offer when it comes to performance, whether it's just office stuff, video editing, or the occasional game. All in a package that's probably a bit more interesting than your dusty old tower. Hopefully you waited to buy a laptop, because these are the sorts of bonuses you'll be getting when 4th gen cores start rolling out this summer. There's still going to be a little bit of a wait until things start hitting store shelves, but you can bet we'll see a fresh new line of Macs trotted out at WWDC, and you can bet they'll be repping Haswell. We might not be post-PC yet, but everything that has to rely on a battery is about to get a whole hell of a lot better, and a lot less tethered to the wall. And who doesn't want that?